Andy Murray has pulled out of the Italian Open in Rome, citing fatigue. The Briton was due to play David Goffin in the third round on Thursday after a run of 10 successive victories on clay. The 27-year-old third seed, who had considered skipping the tournament to rest for the French Open, beat Jeremy Chardy 6-4 6-3 in the previous round. "I've played so much over the past 14 days. I've played 10 matches with some extremely late finishes and my body needs to rest," Murray told BBC Sport. "I actually felt I played a good match yesterday, but my body is tired. I have to listen to that and respect that." Elsewhere in the draw, Roger Federer survived a late fightback by Kevin Anderson to win 6-3 7-5 and book his place in the quarter-finals. If the Swiss beats Czech Tomas Berdych, who overcame local hope Fabio Fognini 6-3 3-6 7-6 (7-2), he could play Rafael Nadal in the semi-final. The Spaniard reached the last eight with a 6-4 6-4 win over American John Isner and will now meet Swiss Stan Wawrinka on Friday. Reigning champion Novak Djokovic came from behind to beat Brazilian Thomaz Bellucci 5-7 6-2 6-3. The world number one next plays Kei Nishikori, who overcame Viktor Troicki 6-4 6-3. 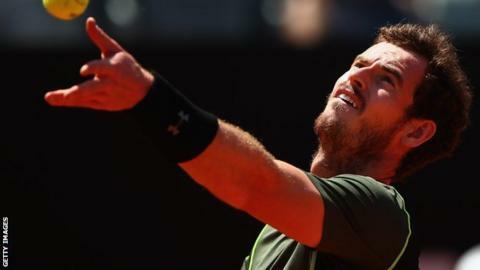 Murray's victory over Frenchman Chardy followed back-to-back tournament victories in Munich and Madrid, where he defeated Rafael Nadal for the first time on clay in the final. Murray's match against Philipp Kohlschreiber in the second round in Madrid started at 01:12 local time - one minute short of the latest ever on the ATP tour. The match finished at 03:00. After several lengthy matches forced the late start, the Scot said: "If they want the players to perform at their best, players shouldn't be playing at three o'clock in the morning." The ATP later said it would review its scheduling policy. World number one Serena Williams has pulled out of the women's event in Rome because of an elbow injury. The French Open begins on Sunday, 24 May. "This was a hard-headed professional decision from Murray, after an element of indecision earlier in the week. The Italian Open is an important tournament in its own right, but with the effects of the past two weeks catching up with him, why risk undermining what has been excellent preparation for Roland Garros? "Players often retire or withdraw from the events leading up to Grand Slams but Murray's CV proves he is no repeat offender. Three days' complete rest is likely to be of greater benefit than another couple of matches when the French Open and Wimbledon come around."